From Popfun Merchandise. Siren: a woman who uses her attractiveness to entice or allure men, sometimes to their death. Yup, that's Poison Ivy, Harley Quinn, and Catwoman! 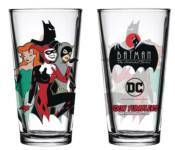 These villainous vixens appear in vivid color in the artwork surrounding this fantastic Batman: The Animated Series Gotham Sirens Toon Tumbler Pint Glass that also displays the TV show's logo.